QUÉBEC CITY, QUEBEC--(Marketwired - July 27, 2015) - The governments of Canada and Quebec announce the extension to the Investment in Affordable Housing (IAH) agreement, for the period from April 1, 2014, to March 31, 2019. This agreement, which will result in a combined investment of some $577 million over five years, will help improve the housing conditions of many Quebec households with low or moderate-incomes. These investments were announced today by the Honourable Denis Lebel, Minister of Infrastructure, Communities and Intergovernmental Affairs, Minister of the Economic Development Agency of Canada for the Regions of Quebec and Member of Parliament for Roberval-Lac-Saint-Jean, on behalf of the Honourable Candice Bergen, Minister of State (Social Development), and by Pierre Moreau, Minister of Municipal Affairs and Land Occupancy and Minister responsible for Housing. The investment of close to $283 million in 2014 and more than $343 million in 2015 by the two levels of government, through the modernization and improvement budget, was also highlighted. 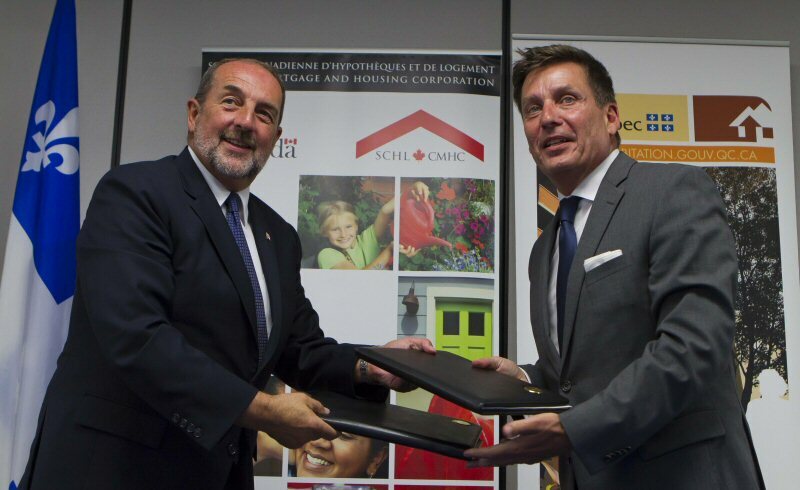 This funding, for the renovation of Quebec's federal-provincial social housing stock, is also contributing to enhancing the quality of life of many low-income households. "As a federal government, we work closely with our provincial and territorial partners so that our significant investments in housing help those who need it most. Our investment in this affordable housing agreement allows flexibility so that Quebec can target the funding to address local needs and priorities, leading to stronger communities and a stronger Canada," said the Honourable Candice Bergen. "This significant investment will not only help ensure Quebeckers have access to quality, affordable housing, it will also create jobs and opportunities for apprentices in communities across our province," said the Honourable Denis Lebel. "This agreement, which will increase the supply of social and affordable housing, provides all the flexibility needed to ensure that the funds are used according to the priorities of the Government of Quebec. These sums are in addition to the substantial investments we make every year to assist thousands of Quebec households," said Minister Pierre Moreau. The federal funding for the extension to the Investment in Affordable Housing agreement comes from Canada's Economic Action Plan, under which the Government of Canada committed to invest more than $1.2 billion nationally over five years. From April 2011 to March 2015, the IAH agreement helped nearly 160,000 Quebec households. The announcement was made at the Résidence des Diamants, a 101-unit affordable housing project for semi-independent seniors and persons with disabilities.The units were developed through a combined IAH investment (2011-2014) of $6.9 million by the Government of Canada and the Government of Quebec. Annually, the Government of Canada, through Canada Mortgage and Housing Corporation (CMHC), will invest approximately $2 billion in housing. These investments are improving the quality of life for Canadians living in social housing and low-income households, including individuals who are homeless or at risk of homelessness, seniors, persons with disabilities, recent immigrants and Aboriginal people. To find out more about how the Government of Canada and CMHC help Canadians meet their housing needs, call CMHC at 1-800-668-2642, visit www.cmhc-schl.gc.ca or follow CMHC on Twitter @CMHC_ca. The mission of the Société d'habitation du Québec (SHQ) is to facilitate citizens' access to adequate housing. Each year, through its various programs and partners, the SHQ helps more than 230,000 Quebec households. To find out more about the programs and services offered by the SHQ, as well as its activities and achievements, or to get housing advice, visit www.habitation.gouv.qc.ca/english.html and follow the SHQ on social networks: Facebook (SocietehabitationQuebec) and Twitter (HabitationSHQ). 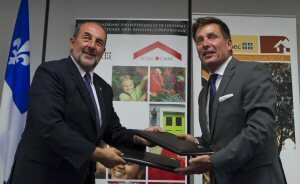 The Honourable Denis Lebel, Minister of Infrastructure, Communities and Intergovernmental Affairs and Minister of the Economic Development Agency of Canada for the Regions of Quebec and Pierre Moreau, Minister of Municipal Affairs and Land Occupancy and Minister responsible for the Montérégie region at the signing ceremony for the extension to the Investment in Affordable Housing agreement in Québec City.